1) People working for Mitch McConnell's reelection. 2) People who come from families that internalize everything rather than fight it out and get it over with. 3) People who are Mitch McConnell. The last several weeks have brought to the fore some ugly realities that the establishment GOP was hoping it could deal with using its go-to conflict resolution strategy: put it off, hope the problem goes away and then perhaps a nap. Led by a host of Republican senators whose most notable achievement is getting elected a lot, the old guard has been busy publicly admonishing the more Tea Party-minded additions to the fold that they don't know anything. Because they haven't been elected a lot. Now, I will concede that, yes, the establishment dinosaurs do have a knack for winning elections. However, the gaps in between those victories tend not to be filled with much to crow about unless you're a fan of things like the Department of Homeland Security, Medicare expansion or being part of a team that's only won the popular vote in a presidential election once in twenty five years. A school of thought is emerging amongst us extremists that it might be rather refreshing if they applied some of that ability to battle and prevail over Democrats in elections to the legislative process. So a schism is erupting that sees one side yelling, "Hey, we win elections and stuff!" and the other side responding, "Yeah, but you're kind of hosing us once you do!" The eruption, however, isn't from a new source of conflict. In fact, this is a decades-old ideological volcano in the GOP that has had spectacular consequences after blowing up in the past. This New York Times article almost deserves a sentence by sentence examination but let's just grab a couple of chunks and look at them. After the budget standoff ended in crushing defeat last week and the political damage reports began to pile up for Republicans, one longtime party leader after another stepped forward to chastise their less seasoned, Tea Party-inspired colleagues who drove the losing strategy. Hatch is indeed "seasoned". Four hundred and thirty seven years old and serving his fiftieth term (okay maybe only his seventh) in the Senate, Hatch can not only win elections but will more than likely survive the zombie apocalypse. By the way, Hatch was first elected to the Senate largely by campaigning on the premise that his three term incumbent opponent had been in Washington too long. You can't make this stuff up. The adults Hatch mentions are the same grown-up election winners who brought the Republican party to the point where it was helpless to stop the passage of Obamacare. These same adults also spent the last debt ceiling showdown whining about Ted Cruz rather than discussing the ticking time bomb of debt that will one day blow up this economy. These adults actually sped up the countdown timer on the bomb. But, hey, winning elections and stuff. Oh, the "political damage" from the "crushing defeat" was so overwhelming for the GOP that less than three weeks later President Obama's job approval hit an all-time low. The obvious reason for this swan dive in The Lightbringer's approval numbers is that Obamacare had a rocky start. Because it's awful. I believe it was Ted Cruz who was mentioning that a lot in September and early October. Silly unseasoned kid. 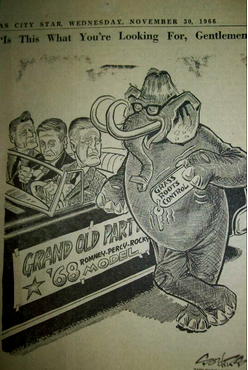 The moment draws comparisons to some of the biggest fights of recent Republican Party history — the 1976 clash between the insurgent faction of activists who supported Ronald Reagan for president that year and the moderate party leaders who stuck by President Gerald R. Ford, and the split between the conservative Goldwater and moderate Rockefeller factions in 1964. Some optimistic Republicans note that both of those campaigns planted the seeds for the conservative movement’s greatest success: Reagan’s 1980 election and two terms as president. Oh, the Times will be the Times-there is nothing "optimistic" about it, that's actually what happened. The Republican party is not, and has not been for quite some time, an ideological lock-step affair. That's something that we should be celebrating rather than having fits about. If you don't like in-fighting and you want to pretend a lot, the other guys would love to have you. The present battle is a most necessary one not only for the future of the party but the future of the country. The problem with the "capitulation for the sake of fighting another day" approach the GOP has taken for decades is that it allows the Democrats to push the center ever leftward by increments. We are now at a point where the nation's wealth is shifting to those who bloat and perpetuate the federal behemoth. The IRS is going to punish you if you don't purchase something that is going to be far more expensive now that it is required than it was when it was a free choice. Let's say your case for maintaining the status quo on either side isn't a very strong one at this juncture. In a sane world, anyone seeking to oust the people who have been in charge while the country headed down this path would be lauded. Instead, we are demonized by a GOP establishment that is eerily in concert with the MSM and the Democrats. Whenever I talk to my more moderate Republican friends (and I have many) about challenging incumbents their side of the conversation is always filled with the same excuses masquerading as reason. "I have no problem with incumbents being challenged but this just isn't the right time/challenger." And: "You (Tea Party people) just need to find better candidates." My only response to them now is, "How are you not at the point where you want to go out and find better candidates?!?!?!?" If you can survey the political landscape in America for the past twenty years and are OK with at all that has gone on while Orrin Hatch, Mitch McConnell and the rest of the adults in the GOP have held sway in the party then you and I definitely have a problem. If you think it's all right for McConnell to be reelected and continue his capitulating reign of "meh" while the progressives in the Democrat party run roughshod over the Constitution, your liberties and anything else they can get their filthy statist paws on then yes, we are going to fight about some things. The "another day" and "next time" approach to governance employed by GOP leadership in recent years isn't a strategy, it's a pathetic reality avoidance mechanism. And it is ruining the country. The Republicans had better find a way to provide, and articulate that they are providing, a clear contrast to the Democrats. That they have done both so poorly for several years is the real problem the party is facing. Not demographics the culture or whatever other monsters they want to find under the bed. Decimating economically crippling policy before it becomes law is far more important than whether everybody is happy in the Senate lunchroom. And if you want to continue to enjoy your rights you may want to think about getting behind candidates and legislators who aren't afraid to lose friends while thwarting the statist onslaught. There is no inherent virtue in bipartisan cooperation with an opponent who never gives anything in return. In fact, it's becoming rather dangerous. Republicans could use some leaders who grasped this simple fact. They don't have any at present. So, yeah, let's fight for the party. If those of you fond of the GOP status quo want to remain true to form and just wait to fight another day while we run you over I'm OK with that too. Stephen Kruiser is not only a comedian, but he's also a grassroots activist who has been working to rebuild the Republican party for decades. I just simply will not vote for another RINO, it just gets worse with every election cycle. I've voted straight Republican for 50 years, no one can question my loyalty, but I'm tired of holding my nose and watching the GOP trying to merge with the democrats. When you look at who benefits from attacking the tea party, you really have to wonder what our Republicans are thinking. There are 2 groups of people who benefit, if there is no tea party, Democrats and Establishment Republicans. Personally, I wouldn't want to be associated with either, but someone has to prove to me that an Establishment Republican is different than a Democrat. Oh, I know they caucus with Republicans, maybe even Ted Cruz, but then they do as much as they can to undermine them. John McCain is an establishment Republican. What is he famous for? Oh yeh, McCain/Feingold. What did that do for the country? I know, it brought about a whole bunch of changes in the tax code that Democrats took advantage of and put out a whole bunch of negative ads against McCain and Sarah Palin. I hope you're serious about retiring John, it's time. The split is inevitable. GOP Rinos are openly scorning the Tea Party and using Big Money to fight against Tea Paty candidates in 2014. How ignorant these Rinos are. No party stands for free enterprise more than the Tea Party. They just want to control us with their money, they have no regard for the Constitution. They are no better than Obaman pretending to stand for The People. They think of us as slaves who will go along with them, as we did by voting for their candidate, Romney. I predict, not again. And having exposed Rand Paul and Marco Rubio will not be the end of defining the The Tea Party, is is only the begining. A-FREAKIN'-men Stephen!!! The Garnering Officious Powers wing of Abraham Lincoln's battered and scarred party are starting to notice the storm clouds gathering off to the west......and they're getting nervous. A key to our ultimate victory will be our connectivity. As long as we can directly share and discuss our ideas via sites like this and mine the vast resources of information available today from blogs to The Blaze et al; Today's online society gives us an opportunity unparalleled in history to drag their feet to the light of the public bonfire so-to-speak. The Gargoyles Of Prominence wing of the Party are waking up to this and are proceeding to reawake the Kraken of old guard money and resources of their own. It's gonna get nasty before it gets any better. Here's hoping I have the courage to see it through with the rest of those willing to take up this battle. For now, two words....BRING IT!!!!!! I agree. Excellent, well put points. The current republican leadership never seem to get anything done that might project good conservative solutions while shining a light on the destructive nature of liberalism. And why don't they attack democrats with the same vigor democrats project? When a democrat mentions 'at war with women' republicans should have a list of names of democrat louts and what they have done to women, no holds barred. Since they don't I have to believe that the Boehner's, the McConnell's, the McCains and the rest of those lazy bums agree with the democrats. What a bunch of losers. A bipartisan group of legislators introduced a bill to protect email privacy today in the House and Senate. FreedomWorks activists sent over 5,000 messages to Congress prior to the bill’s release, urging their representatives to cosponsor this important piece of legislation. At Western Liberty Network's Third Annual Leadership Training Conference and Expo, 104 attendees from Oregon and Washington spent a pleasant Saturday learning how to take responsibility for their local governments and change the fabric of their political cultures. What truly matters to Millennials? The struggle to find a job after college? Student Loans? Youth Unemployment? All these issues have hit our generation extremely hard, and it's time we rise up and engage our elected officials to find solutions to these very important issues.